First, get the dates right! The Chinese year is on the lunar cycle, so this year Chinese New Year’s Day is February 19, 2015. In San Francisco though, the festivities happen over a period of three weeks–before and after Chinese New Year’s Day. 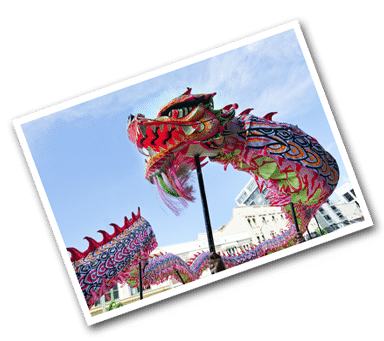 Your Chinese New Year’s experience could begin as early as February 14, and then end with the largest Chinese New Year Parade outside of Asia on March 7th. This gives you a big window for your trip so you can shop for better prices on airfare or hotel packages. You need to book your flight well in advance of your trip and get visas (if required) ahead of time. An average of 3 million people visit San Francisco for Chinese New Year, so book your airfare and hotel accommodations early. Historically, San Francisco has mild winters. From February through March the average low is about 49˚ F with an average high of 61 to 62˚ F. (www.intellicast.com) It does rain in the Bay Area in winter time (3+ inches on average in San Francisco), so be sure to bring a rain jacket, umbrella, or plastic travel poncho in addition to warm clothing. You won’t have to worry about snow unless you want to visit Lake Tahoe after a visit to San Francisco. If you decide to take a day cruise on the bay or visit Alcatraz Island, expect to dress in warm layers. The San Francisco Zoo has red pandas, which are adorable raccoon-like animals from China. Outside China, San Francisco is one of the best places to try Chinese food. Try some dim sum or a traditional Chinese dinner. A great place to read about Chinese food is on foodie review sites, such as Food Nut (http://www.foodnut.com/chinese-restaurant-san-francisco). Learn more about these restaurants at your favorite review site, such as Yelp, for more information. San Francisco is a hilly city, and San Francisco’s Chinatown is no exception. When you travel with a senior, take care to consider the person’s endurance. For example, watching a parade in one place and then walking to a nearby restaurant might be a good plan for someone with poor endurance. Consider bringing a folding chair or a transport chair so that they can enjoy everything with you! For more active seniors, you might be able to plan on some walking and exploring with one or two stops to rest and drink water. Before you get to Chinatown, identify some resting spots or determine a path that is not all uphill. For steep parts of a path, you might consider getting a low cost transport chair, which can easily fold up and be stored in a car. For seniors who are not very mobile and who plan to stay with family for a while, you can contact a medical supply shop to rent a folding wheelchair for the duration of your family member’s visit. Public and private transportation in San Francisco is relatively easy to navigate. Connect with cable cars (http://www.sfcablecar.com), taxis, MUNI (http://www.sfmta.com/getting-around/transit/schedules-trip-planners), and BART (http://www.bart.gov). And there is always walking! Continue the conversation on the TripCompanion Facebook page. Tell us about your experiences in San Francisco with seniors. What worked? What didn’t?